Here in the following you'll get Pakistan Public Works Department PWD Karachi Jobs 2019 Latest Vacancies announced for the Sindh Domiciled candidates for the following vacancies. 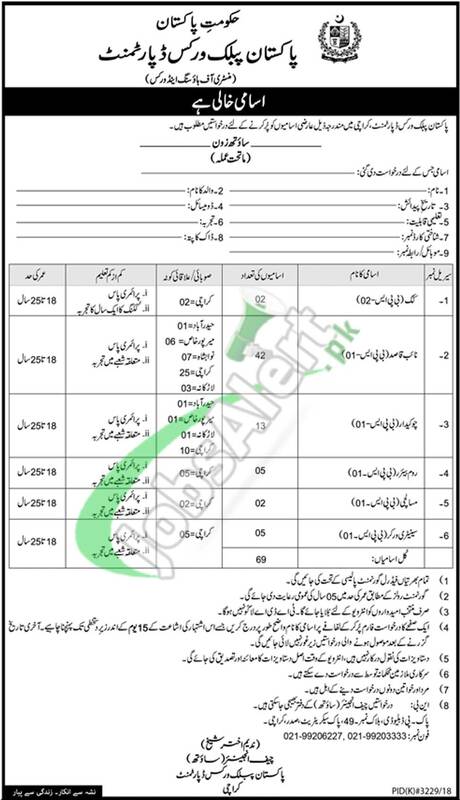 Pakistan Public Works Department, Karachi Jobs are such as (Cook (BPS-02), Naib Qasid (BPS-01), Chowkidar (BPS-01), Room Barrier (BPS-01), Masalchi (BPS-01), Sanitary Worker (BPS-01), Sanitary Worker (BPS-01)) on temporary basis. Candidates possessing qualification from Matric/Middle/Primary and relevant skills and experience are welcome to apply on or before the last date 11th March 2019.